If you want to peel a few tomatoes for a homemade sauce or batch of gazpacho, all you need is an open flame and those tomato skins will come off in no time. If you have a large batch of tomatoes to peel, blanching them en masse is more efficient. But if you only need to peel a few, J. Kenji López-Alt at Serious Eats suggests you just torch them over an open flame. It's much faster. 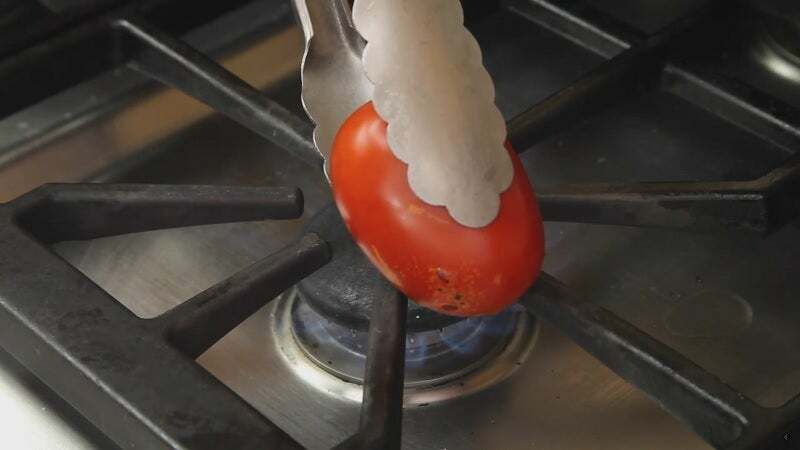 Use a knife to score the bottom of the tomatoes with an "X," then use some metal tongs to rotate the tomato over a gas burner on your stovetop. The heat from the flame will cause the moisture under the skin of the tomato to evaporate, making the skin separate from the meat of the tomato. You can do the same thing with a mini blowtorch too. Once you've torched most of the tomato's skin, just peel it off under cold running tap water.